When sliced bread was invented in 1912, it was the greatest thing to happen since air conditioning. 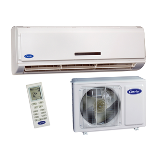 You see, our founder, Willis Carrier, invented the first modern air conditioning system in 1902. And we’ve been perfecting his idea ever since—while enjoying the occasional piece of toast. Ask your Carrier® expert about the 2015 energy efficiency standards to ensure your new air conditioner meets government regulations for your area. The way we see it, cool breezes are best left outside in winter. That’s why our innovative gas- and oil-fired boilers are designed to spread nothing more than consistent warmth—not to mention peace and quiet—through your radiant system. Think of your furnace as the heart of your home. In the winter, it's essential to radiating warmth. During the summer, it plays a vital role in moving refreshing, conditioned air from your cooling system. And all year long, your furnace could provide constant air circulation to keep you more comfortable. Not only that, but many of our furnaces do it all so efficiently your own heart might skip a beat when you see how low your utility bill is. There’s an invaluable energy source buried right in your own backyard. The first step toward clearing your home's air is knowing what’s hiding in it. An Indoor Air Quality test offered through your Carrier® dealer can detect common air pollutants in just 30 minutes, while offering strategic Carrier solutions to address your air issues. 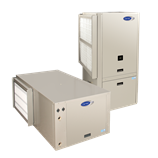 Whether you want to replace an existing air conditioner or heat pump—or reduce your energy costs with a Hybrid Heat® solution—our packaged products could be the creative solution you’re looking for.